Salvia disjuncta is from southern Mexico and further south. 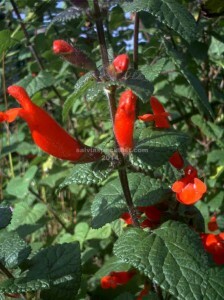 It is one of those 2m caney salvias which has scarlet flowers mainly in cooler months. It will grow in part shade if you need to protect it from frost. Cuttings are easy to grow. It hasn’t set seed for me but could do so in a warmer area. The oldest stems could be cut to the ground in summer. Adenophora has similar flowers on a similar plant.